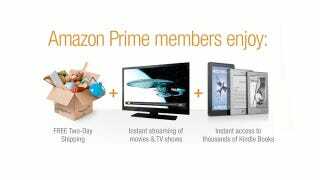 Is Amazon Prime a Good Gift? Amazon prime is pretty much the best thing in the world. Free two-day shipping. Streaming movies—including Mean Girls. It just makes life easier. But is it a good gift on its own? On one hand, Prime makes buying stuff unbelievably easy. A few clicks teleports things from the internet to your home, in just two days—for free! On the other hand, it's even less personal than a gift certificate. Actually, it's even worse than one of those spend-anywhere gift cards—it's basically like offering someone a free ride to the mall whenever they want. So what do you think, good present or worst present?